I wrote a little about The Elements of Journalism, when I hit the section praising David Protess for tricking Alstory Simon into confessing to murder. The thing about that is, it isn’t just that the authors praised Protess, and that this praise became embarrassing a few years later, that made this example stand out. It was that Protess explicitly broke some of the rules outlined in this book. This should have been a red flag signaling that maybe they should dig deeper before using the Simon case as an exemplar. But it didn’t, because the rules of journalism aren’t prescriptions, they’re rationalizations. That is, they aren’t scientific rules to guide journalists moving forward, they’re religious rationalizations used to justify what they want to do. They’re used to justify a belief rather than find the truth. The major problem with this book is that it does little, if anything, to change that. To the extent that it provides justifications that may be chosen from ad hoc, it makes things worse. When the author started talking about using the scientific method as a guide to better journalism, I thought, maybe he’s onto something. But the bedrock foundation of the scientific method is that you must do your best to explain how your findings can be proved wrong. You must show how to falsify your results. I’m quoting Richard Feynman a lot because I’ve just recently read his books, and so they’re still in mind, but this is not a new idea. Journalism, in practice, seems to be the belief in the supremacy of experts. Whether it’s catastrophic man-made global warming or the efficacy of government projects, journalists don’t investigate the facts, they poll the experts. As so often in the book, the authors say otherwise—that “a journalism that focuses on the expert elite may be in part responsible for public disillusionment”— but in practice they use the expert elite to show how the press is failing to properly educate the public on issues such as catastrophic global warming or electing Republicans. The true purpose of journalism is that “journalists, as members of [the] cognitive elite” 1 should educate the people so as to make choices that journalists agree with. For example, the election of Bush, and conservatives in general, is a failure of the press to help people understand their alienation from the present. The failure of so many Americans to “even understand” the causes of their alienation suggests that at least part of the problem has been the way the press covered these issues as they developed and the political strategies and rhetoric they inspired that favored extreme positions. Similarly, the authors talk about how the journalist’s methods must be objective, for the journalist themself cannot, as a human, be objective. That in itself could be important, especially when the authors then invoke the scientific method as an example. But, critically, they never describe what the scientific method is, only that it somehow involves scienceyness that leads to some personal process of truth-seeking. The truth here, in other words, was a complicated and sometimes contradictory phenomenon, but seen as a process over time, journalism can get at it. It attempts to get at the truth in a confused world by first stripping information of any attached misinformation, disinformation, or self-promoting bias and then letting the community react, with the sorting-out process to ensue. The search for truth becomes a conversation. The problem here is that it is a biased candle on both ends: where the journalist stops stripping misinformation will be a function of their bias, and where they stop the complicated and contradictory conversation and decide, yes, the truth has been reached enough to publish, will also be a function of their bias. I’ve already described how this failed Alstory Simon and may have let a murderer go free, but it’s also visible in the story of Abner Louima, the man who was supposedly sodomized with a nightstick to the tune of cops praising Rudy Giuliani. One year later, Louima recanted his Giuliani accusation. This is the first I’ve heard of the recant, but the author describes this as a triumph of iterative journalism. Now, perhaps I’m just reclusive, but getting to the truth on what was then a major issue, long after it is no loner a major issue, does not set a high bar as a triumph of journalistic truth-seeking. This is the big problem with iterative news by a partisan media: it goes only so far as it needs to until “it looks right”, until “they know it when they see it.” After that, it will take forever for the truth to come out, and then the truth will be hidden on page 33. Further, immediately after invoking the scientific method, he segues to a science of consensus on global warming. But besides being a reliance on “the expert elite”, the consensus story was precisely the kind of iterative fakery whereby journalists stop looking once they find an answer they want. It was not 97% of scientists—how do you even measure who is or is not a scientist? It was 97% of researchers in a field dominated by government grants and even government-employed researchers, where paychecks don’t come for saying the government doesn’t need to get involved. It was 97% of researchers publishing in journals that later leaks—not, as far as we can tell, by a journalist—showed to be actively rejecting submissions by researchers who did not follow the line of that expert elite. It was like reporting uncritically that a dictator received 97% of the vote in their country. The big story behind the 97% was the corruption that made the number possible. But that story wasn’t discovered because the iterative process stopped at the survey results. This story was precisely the “journalism of assertion” that he decries further down the page. Beyond even that, though, most reporting on the study also didn’t report that it was a mostly meaningless study even at face value. The study did not ask about catastrophic global warming. It asked whether humans play a role in global warming. Even skeptics of catastrophic global warming believe humans play a role. Journalists reporting on the study did not understand the controversy, and did not bother to find out. The author understands this phenomenon. He describes it later when talking about humility, when a reporter reported that Pentecostals were praying to God to kill everyone in the Capitol—not realizing that Pentecostals use the phrase “slay in spirit” to mean something entirely different, spiritual enlightenment. Again, the reporter did not understand the people they were reporting on, and didn’t bother to find any Pentecostals to clarify. The problem could have been solved simply by showing the article to some of the people being reported on. It would be a good example if its lesson weren’t ignored throughout the rest of the book. Another part of the scientific method is having reproducible measurements. Other researchers must be able to perform the same measurements and either get the same results, or potentially prove you wrong by getting different results. In the case of journalism, readers must also be able to reproduce your measurements. But if it is to emulate the scientific method, you can’t just explain your reasons for front-paging or hiding news in a one-off sciencey way. Those reasons must be consistent. Too often, the reasons why something is or is not news change depending on the reporter’s, or paper’s biases. If the scandal is a Democrat, it’s local news, and doesn’t deserve national exposure. If it’s a Republican, it points to wider issues, and deserves a national conversation. And when scandals are reported, they are about individual foibles when it’s a Democrat, and about party if it’s a Republican. Too often the first explanation that matches the reporter’s biases is chosen as the reason for doing or not doing the story, or including/not including information such as party affiliation. Just as facts are iteratively searched until biases are met, so too are reasons. But that’s not scientific. It isn’t testable. It isn’t applicable over time. That is, readers cannot reliably apply those reasons to future stories and predict which stories are news and which are not. The reasons are justifications, not rules. They’re religion, not science. The problem with not measuring readership and denigrating profits is that the only alternative is government-subsidized journalism. Otherwise, news organizations that are financially successful and able to replicate that success—that is, those who treat readers as customers and profit from it—will succeed, while those that fail financially or are unable to recognize their success will fail. Most of the sections seem to talk a good game, use examples that undercut the advice, and then end with some variation that each journalist should rely on their own “good judgment”. That may well be the best advice we can hope for, but it doesn’t live up to the aspiration of emulating the scientific method. Bias is the elephant in the living room. We’re in denial about it and don’t want to admit it’s there. We think it’s less of a problem than the public does, and we just don’t want to get into it. In general, The Elements of Journalism doesn’t get into it. It eschews measurement—such as sales figures—while paying lip service to the scientific method and then telling journalists to do what feels right as part of the anointed. It is probably the perfect textbook for modern journalists. He also doesn’t quite get around to saying that advertisers are the real customers. If you enjoy confirmation journalism, you might also be interested in Confirmation journalism and the death penalty, False positives, the Internet, and the grievance media, and The gullible media and the chocolate factory. If you enjoy The Dream of Poor Bazin, you might also be interested in Intellectuals and Society, Scoop, The First Casualty, Advise & Consent, For the Love of Mike: More of the Best of Mike Royko, Call Northside 777, The Best of Mike Royko: One More Time, The Tyranny of Clichés, All the President’s Men, World Chancelleries, Liberal Fascism, Letters to a Young Journalist, Inside the Beltway: A Guide to Washington Reporting, The Vintage Mencken, Deadlines & Monkeyshines: The Fabled World of Chicago Journalism, A Matter of Opinion, Kolchak: The Night Stalker (TV Series), Front Row at the White House, The Prince of Darkness, The Vision of the Anointed, The Powers That Be, and The Dream of Poor Bazin (Official Site). If you enjoy journalism, you might also be interested in Kolchak: The Night Stalker (TV Series), All the President’s Men, Call Northside 777, The President’s freelancers, Confirmation journalism and the death penalty, Fighting for the American Dream, Mike Royko: A Life in Print, The World of Mike Royko, Fit to Print: A.M. Rosenthal and His Times, A Reporter’s Life, Deadlines & Monkeyshines: The Fabled World of Chicago Journalism, Inside the Beltway: A Guide to Washington Reporting, Letters to a Young Journalist, All the President’s Men, The First Casualty, Scoop, and Are these stories true?. Iterative journalism is like the Red Queen in Alice in Wonderland: “Sentence first, verdict after.” The Elements of Journalism praises David Protess’s project that railroaded a mentally disabled man into prison for fourteen years, because it served their bias. 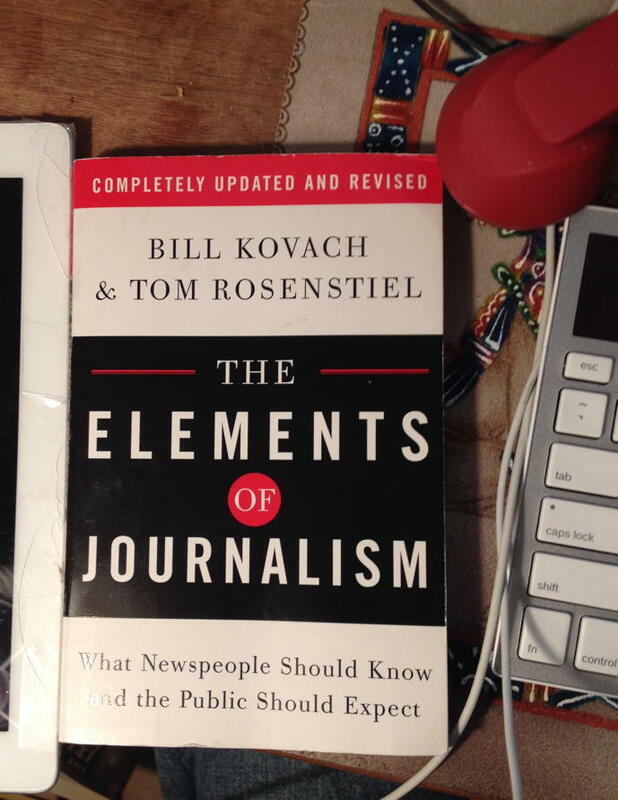 The Elements of Journalism is meant to be a sort of textbook for journalistic thinking, compiled by asking journalists how they justify what they do. That’s not how they worded it, but that’s basically the end result. If 97% of Scientists Say Global Warming is Real, 100% Say It Has Nearly Stopped: Paul C. Knappenberger and Patrick J. Michaels at Watts Up With That? The Elements of Journalism last modified March 29th, 2015.